Rising to an altitude of 1804m between the Delatite and Howqua Valley is very special mountain, Mt.Buller. Named after an official in the London Colonial Office, Charles Buller. To the local aboriginals it was known as Murrang or Marrang. The aboriginals visited the mountain in the summer months in search of a delicacy the Bogong moth - after which the Bogong High Plains took their name. It was not until 1924 after the establishment of the newly formed Ski Club of Victoria, that the first group visited Buller in winter with the intention of skiing! In 1926 the The Ski Club of Victoria (SCV) hosted its first ski championships at Buller. 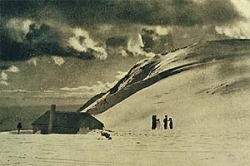 The first Mt Buller Chalet was built in 1929 and skiing holidays became a reality. SCV built and operated the Bourke St rope tow in 1949 and the rapid development of Buller followed. 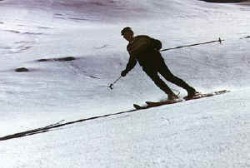 1964 was one of the greatest snowfalls on the Australian Alps in modern history. It was no surprise that a small group of skiers, experienced and otherwise, thought it would be a good idea to build themselves and anyone similarly inclined a lodge in the mountains. The most convenient, and at that time best served with roads and accessibility was Mt.Buller.Much time and burning the midnight oil was spent by this small group in raising interest among friends, and friends of friends to raise capital and enthusiasm. the former being hard to come by, but the latter had no bounds. It could not be done in the time between October and May the following year, they were advised. 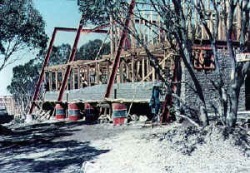 Sure enough by winter 1965, the Lodge was occupiable, liveable and comfortable. Complete with its own electricity generator, oil heater, gas cooking and hot water, drying room, septic toilet system, and above all that camaraderie that has never left the place, and is now carried on by the second and third generation, offspring from the original members, plus new friends and new memebers who have always been made very welcome, and who have offered fresh ideas and expertise. The Club has always been very active in promoting competition in all skiing disciplines, and has excelled in club racing, always managing to take off a few prizes, and especially in freestyle has it been to the forefront. In the early 1990's the new and younger management decided that the Lodge building and facilities needed upgrading to attract new active members. A drive was instigated with plans for the complete re-building and re-furbishing of the facilities. This needed lots of money, so the membership structure was redesigned to include full membership of offspring and their families, of existing members, and together with new keen members enough money was raised to go to the bank for a loan to build a magnificent lodge, but still maintaining a common family layout. The lodge is situated only 100metres from the Village centre, restaurants, shops, transport, ski slopes and the ticket office and lifts.